Becky Hammon will be the first full-time female assistant coach in any major professional men’s sport in the United States. That impulse to avoid difference rewards cowardice—politely called “risk-averse behavior”—as teams bypass players that differ from established norms, even if they can help. Someone has to choose to not be the coward. It took the St. Louis Rams’s Jeff Fisher to make the decision to not be another NFL milksop and draft Michael Sam at the end of the seventh round. Gregg Popovich, coach and Kaiser of the San Antonio Spurs, is no one’s idea of cowardly. So predictably, even obviously, it was Coach Pop who made the decision to hire Becky Hammon as the first full-time female assistant coach in any major professional men’s sport in the United States. 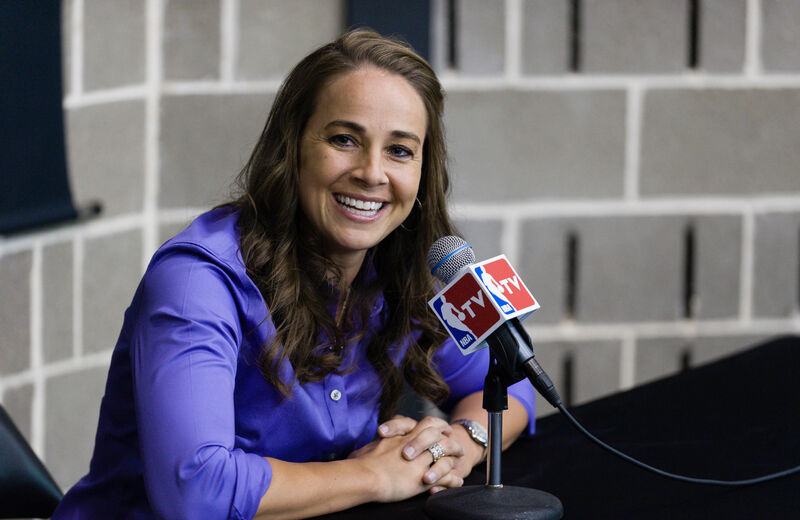 Hammon comes to the Spurs after sixteen years in the WNBA, her last eight with the outfit in San Antonio where she got to know the Spurs operation. But Becky Hammon on a bench was going to happen. As Kate Fagan wrote in her indispensable piece on the hire, “If you know Becky Hammon, one thing has always been clear: She would become a coach after she finished playing…. Becky Hammon by all accounts has the skills to coach. Yet that glass ceiling would have been a glass fortress if not for Pop’s being Pop. Of course it was going to be Coach Pop. Beneath the military crew-cut and Roger Murtaugh demeanor, Coach Pop lives his life as the reality of Phil Jackson’s image. He doesn’t talk in New Age riddles and hang out with lefty celebs while, when it matters, scoffing about keeping politics out of sports. Instead, Coach Pop looks for real ways to make his corner of the world a little more just. Hiring Becky Hammon on the merits of her ability—while not giving one holy hell about the fallout in Texas or beyond—is how he does it. I don’t know if a part of Pop is also fighting for the idea that there is a place for women in sports beyond being sexist clickbait, but that’s the result. I do know from my interactions with the man that he admires those who have historically risked their perch of privilege in pro sports to impact the works. He thinks about the world beyond sports and wants it to be better. American sports—structured and codified over a century ago as a leisure pastime created by men for male consumption—just got marginally better, and that is cause for celebration. While the NFL seems to see disrespecting its female fan base as part of its mission statement, Coach Pop—by just being Pop—lives by a different code. Because of that code, Becky Hammon will be a coach in the NBA. It feels great to tell my young daughter about the news. Hell, it feels great to even type the words.